The power foward of the Bayhawks looks to the future. Kristen Rajczak recently caught up with him to talk about his Gannon career, about his stats this season with the Bayhawks, and about the time he went up against LeBron James. Erie Bayhawks power forward Kyle Goldcamp's personal "best" basketball moment happened in Erie, though it was years before he became Gannon's golden knight. As a high school senior at Pittsburgh Central Catholic, Goldcamp led his team to an overtime win against Erie McDowell in the 2004 PIAA playoffs. He scored 20 points and had 18 rebounds. "McDowell had just been ranked No. 1 that week," he says. "It was a really impressive game for me individually, but it was also really cool to beat the No. 1 team in the state and end their season." Don't get the wrong idea. Goldcamp, though confident in his abilities on the court, could never be thought of as a showoff or a big talker. Rather, Goldcamp says he's, "not one for the limelight, really." His recent stint as poster boy—well, billboard boy—for the Erie Credit Union was about as much attention as he can take. "I get red in the face," says Goldcamp, 24, when asked how it felt to see himself on the billboard. "When it first came out, everybody was jagging on me about it. Messing with me. It's a cool thing to see, but I'm happy that they're gone." He might have to get used to being noticed. Four players from the Bayhawks played in NBA games this season. And, having started 18 games in his second with the Bayhawks, Goldcamp could be next. While he finds being on national television a "terrifying prospect," Goldcamp also says playing in the NBA is the "ultimate goal." "I've had the pleasure of working out with the guys in Cleveland, the Cavaliers, the last two summers, and I held my own against them," he says. "I think sometimes it's just who you know and if you make the right impression on someone at the right time. Then, you have that opportunity and you have to make the most of it. I hope I can make it to the NBA." Even though he is NBA sized at 6'10" and 230 pounds according to his Bayhawks statistics, Goldcamp says trying to make it that far didn't occur to him until college. In fact, he was a pre-med and biology major at Pitt-Johnstown and then at Gannon. "At Gannon, I got to my junior and senior years and people started to say, 'You're good enough to play professionally,' and I never would have thought that was an option," he says. "I thought, well, I have to take a shot. See where it leads me." Leading the Gannon Golden Knights to the NCAA Division II Elite Eight helped his prospects. During the 2008-2009 basketball season, Goldcamp led the Golden Knights in points, rebounds, and shooting percentage, averaging 18.9 points and 9.3 rebounds per game and shooting 59 percent from the field. Goldcamp graduated from Gannon with a degree in biology in 2009. When he was approached by the Bayhawks, Goldcamp says he didn't have a definite plan in place. He tried out—and decided to stay in Erie when he made the team. At first, playing with guys who had played at Divison I schools intimidated Goldcamp. "The first year, I was a little shell-shocked," he says. "I saw a lot of the guys in the NCAA tournament and national championships. But there's a lot I can do, and I'm just trying to make the most of it." That includes playing pick up with LeBron James two summers ago, an experience Goldcamp says he will remember for the rest of his life. But it also means showing he can play on a higher level. This season, Goldcamp racked up a few double-doubles, 13 rebounds in 25 minutes of play back in December, and a 19-point game in February. 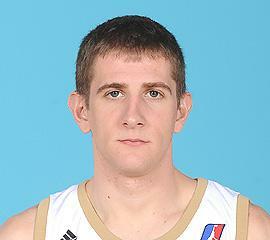 Staying in Erie has worked out for Goldcamp off the court, too. He is pursuing his master's degree in education from Gannon and will be certified to teach when he's done. Goldcamp met Jessica Bush during a class at Gannon when she was a freshman and he was a junior. Bush, a 22-year-old sport and exercise science major at Gannon, says she didn't follow basketball much until they started dating. Now, Goldcamp says she comes to every game. "It's really cool to watch him play and see him doing something he really loves to do," Bush says, though she admits she gets nervous about him getting hurt. The pair is open to whatever the future may bring—basketball and otherwise. "I would support him no matter what," Bush says. "I think it would be a great opportunity for him. I'd really love if he did get called up. That's the ultimate goal of anybody in this league, to get called up to the NBA. I'll follow him." Goldcamp says they'll be making big life decisions like that together. But first, he wants her to have a special, memorable wedding day. "I know it might be corny, but it's the truth," he says. "The most important thing for me truthfully is that she has a great day." After what seemed like a long season, "Biggest Loser" comes to an end. See who won and what Kristen Rajczak thinks of next year's trainer lineup. Whether your shopping on a budget or looking for a one-of-a-kind outfit, consignment shops may be the place for you. Kristen Rajczak takes a look at the growing success of Erie's consignment shops. Kristen Rajczak loves a good underdog story. Thankfully the "Biggest Loser" is just that. Kristen Rajczak's been a bridesmaid a few times and she's a heck of a writer. What better criteria did we need to cut her loose on the new Apatow flick? And then there were four... See what Kristen Rajczak makes of the group heading into the finals. Week 1 of "The Office" sans Michael Scott. How'd it go? Kristen Rajczak has some questions.